Newly-elected President of South Africa Cyril Ramaphosa addresses lawmakers in parliament, in Cape Town, South Africa, Feb. 15, 2018. Ramaphosa was sworn in Thursday in Cape Town, after he was nominated in parliament without opposition. The occasion came just over 12 hours after Zuma’s sudden concession to his party’s mounting insistence that he step down before his term officially ends in mid-2019. Ramaphosa, who spent the last four years as deputy president under Zuma and who recently took over from Zuma as president of the ANC, immediately launched a charm offensive on the usually fractious house. He pledged to work with the nation’s many opposition parties, and to remember his place – a stark contrast to his predecessor’s combative nature. Cyril Ramaphosa is cheered by Parliament Speaker Baleka Mbete, left, after being elected President in Parliament in Cape Town, South Africa, Feb. 15, 2018. Those comments generated applause from lawmakers. But not all parties were present. Before nominations began, the far-left Economic Freedom Fighters party walked out, because the party argues that parliament should be dissolved and snap elections be held to replace Zuma. Mmusi Maimane, leader of the Democratic Alliance, the largest opposition party, chastised Ramaphosa and his party for standing by Zuma amid his long-simmering corruption scandals, and also called for early elections. “We don’t have a Jacob Zuma problem, we have an ANC problem,” Maimane said “...This is a moment in our country where we must move Section 50 and go back to the people of South Africa and ask them for a fresh mandate, so that we can bring a new beginning to South Africa." 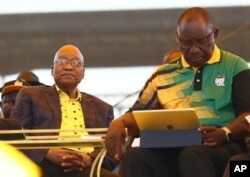 FILE - Newly elected ruling African National Congress (ANC) party president, Cyril Ramaphosa, right, and former ANC president and South African President Jacob Zuma, left, attend the party's 106th birthday celebrations in East London, South Africa, Jan. 13, 2018. Ramaphosa will deliver his first state of the nation address Friday, a speech that Zuma was supposed to give earlier this month. The sudden cancellation of that address signaled the beginning of the end of Zuma’s controversial nine-year presidency, leading to his own party recalling him earlier this week, and nearly ending with what would have been an embarrassing no-confidence in parliament. Ramaphosa has acknowledged that he faces many challenges in his new role. These include cleaning up years of alleged corruption in his own party, trying to reduce the economic inequality that persists nearly three decades after the end of apartheid -- and holding on to his new job when the nation holds elections in 2019. But on this, the first day of his presidency, he – and many lawmakers, from all sides – were hopeful, and grateful to be at the cusp of a new era for the Rainbow Nation.